The proposed half-cent sales tax increase would help improve roads and bridges, build more sidewalks and support water quality projects in Volusia County. Click here to watch a video about the proposed half-cent sales tax initiative. What does this new tax mean for the City of Daytona Beach? If approved by voters in May, the additional half-cent sales tax is expected to generate about $45 million per year countywide for the next 20 years. That amount, which could increase or decrease in subsequent years, would then be split annually between Volusia County and its 16 cities. 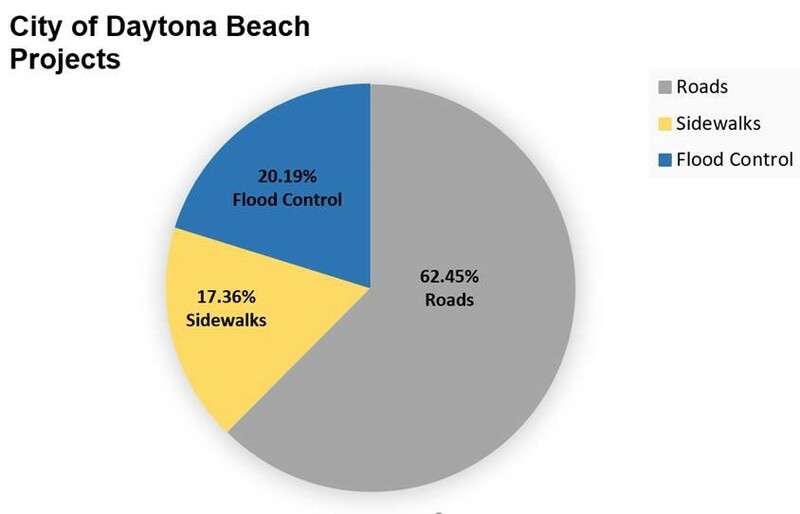 Using the currently established distribution formula, estimates reflect Daytona Beach’s share to be about $3.7 million annually. It is projected that the tax would generate $74.3 million in revenue to Daytona Beach over a 20-year period. Citizens can review the ordinance adopted by the Volusia County Council. How would the city use the new revenue generated by the proposed half-cent tax? The revenues generated from the half-cent sales tax can be used to plan, acquire, construct, reconstruct, finance or improve public infrastructure. Projects are restricted to roads, sidewalks, bridges, water quality and stormwater and flood control. $46.4 million to improving existing neighborhood streets. Click for detailed project information. $12.9 million to creating new sidewalks. Click for detailed project information. $15 million to improving flood prone areas. Click for detailed project information. This half-cent sales tax will be collected in Volusia County and the dollars collected will be used to improve local roads and bridges, reduce traffic congestion, build more sidewalks and support water quality projects in Volusia County. These projects will create many local construction jobs. A large percentage of the half-cent sales tax will be paid by visitors and tourists, which means everyone who uses the roads, sidewalks, beaches and rivers will help pay for them, not just residents and property owners. If these improvements were paid through property taxes, only local property owners would carry the burden. The half-cent sales tax will not apply to purchases of gas, groceries or medicine. For large purchases such as automobiles and boats, the tax would only be applied to the first $5,000 of the purchase because the tax is capped at $25 per purchase. Click here for the countywide information on the proposed half-cent sales tax. The vote will take place in the month of May via mail-in ballots. Registered voters in Volusia County will begin to see mail-in ballots beginning the first week of May. Those ballots should be filled out and returned in the mail to the Supervisor of Elections Office in DeLand. They may also be dropped off at the Elections Office, which is found in the historic Volusia County Courthouse. All ballots must be in the office by 7 p.m. May 21 for votes to be counted. How can I learn more about the proposed half-cent sales tax? The Daytona Beach News-Journal is partnering with our area's chambers of commerce to host town hall meetings countywide in March. Municipal and county officials will be on hand to answer your questions and hear concerns. Each meeting starts at 6 p.m.